Or fill out the form below! There are occasions when we have private bookings which may restrict our food service availability. We recommend that you book before coming for food as we have very limited seating indoors. If you would like to get in touch, ask a question or make a booking, please take a few moments to fill in this form and we will get back to you as quickly as possible. Please also see some of the frequently asked questions below that may help. Yes we do allow well behaved dogs inside and in the garden but they must be kept on a lead. We do not however allow dogs inside if they are wet and/or muddy – there is a sheltered area outside where they can go. We are a very small pub and the smell of wet dog very quickly over powers the pub! Our dog loves everyone but one thing he doesn’t like is if another dog jumps up at the bar and he will let them know he doesn’t approve by being rather vocal! Our pub, albeit very small, is divided into two areas; the bar and the restaurant. 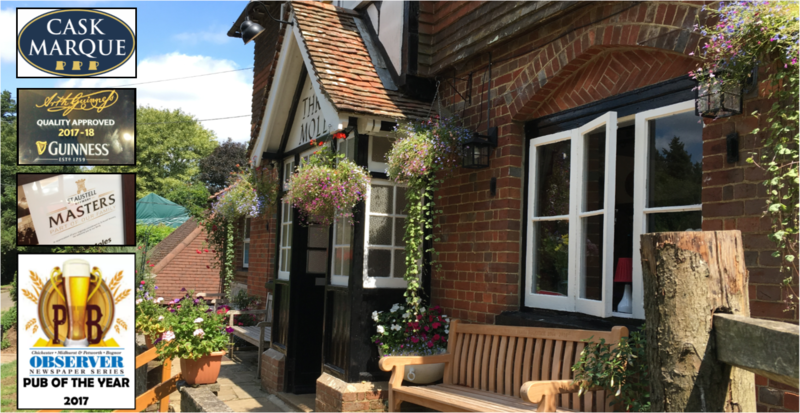 We do not allow under 18s at the bar seating end of the pub however they are more than welcome in the restaurant seating end (assuming there is a table available – please phone if you would like to make a booking), provided they are well behaved and supervised at all times. The Three Moles is a very traditional real ale house / drinkers pub and does not have a separate children’s menu or any children’s facilities. We do allow children in the restaurant and the garden, however parents are asked to respect that as a traditional ale house, it is an adult environment. People come here for the peaceful surroundings! We do. We are limited on space inside due to the size of the pub but dependant on the size of your group, we do have a large marquee in the garden most of the year which is ideal for groups. We can reserve this for your group so please call us for details. Do you do child portions on your menu? We do not have a children’s menu as generally this is not the sort of pub that children come to – it is a very traditional real ale house / drinkers pub. For those bringing children we can split a meal across two plates if you would like us too. We do offer free BT Guest WiFi. Do you allow walkers/campers in the pub? Seem’s like a strange one, but believe it or not there are places that don’t! Of course we do though – all we ask is that if you have muddy footwear, you take it off at the door to help keep the pub carpets clean. We allow coaches by prior arrangement only.